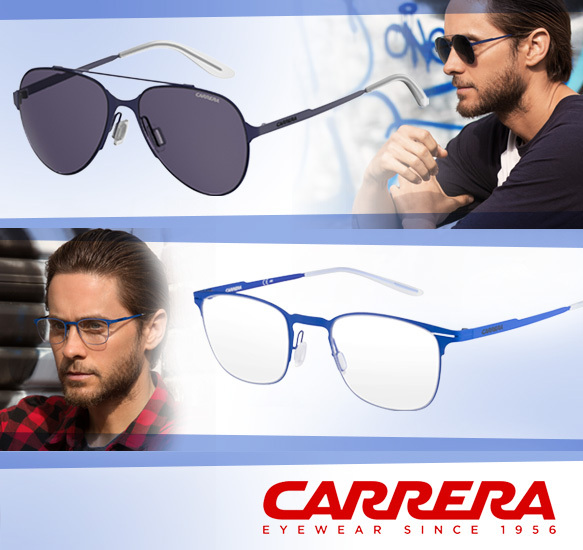 Say hello to Carrera’s spankin’ new Maverick Collection sported by non-other than the maverick himself, Jared Leto! Boasting an independent mind and a bold personality, the Academy Award-winning actor, musician, director and entrepreneur truly embodies the personality of these sunnies and specs. Featuring the iconic pilot profile that we have all come to know and love, the “Impel” sunglasses flaunt an unexpected reverse bridge, holding true to Carrera’s knack for unpredictable traits. Constructed from a feather-light, laser-cut stainless steel and completed with a matte finish, these aviators epitomize modern style. As for the optics, the cutting-edge “Beam” glasses stand out with their electric blue hue. Their ultra-thin and lightweight structure make them comfortable enough for everyday wear, but the cut-out temple details and cool keyhole bridge make them bold enough to satisfy the rebel in everyone! Take a look at these frames – and Jared Leto rocking ‘em – below.